There are no prerequisites to taking an aerial class, and we do not have weight, fitness, or age limits for adults (ages 13+). Youth classes are limited to ages 5-13. We recommend taking a beginner trial class to start off. This 60-minute class lets you try out silks and trapeze to see what you like best. You can also take Intro to Horizontal or Intro to Vertical. It is best to register as far in advance as possible, to ensure that you have the spot you want. Some of our classes get booked up weeks in advance. E-mail info@stlaerial.org if you’re having trouble registering! Aerial classes run 90 minutes, with as few as two or as many as ten students. Fitness classes run 60 minutes. Class time is spent warming up, trying out the moves yourself, watching others to observe form and technique, and doing conditioning exercises. For your first class, we recommend wearing close-fitting workout clothes that cover the armpits and backs of the knees. Yoga pants/leggings and a t-shirt would be an appropriate outfit- please do not wear jeans or any other clothing with metal or sharp elements. You will need to remove all jewelry except small earrings. We work in bare feet, so be prepared to take off your shoes! Make sure to come hydrated and bring a water bottle. If it is your first class, we ask that you arrive 15 minutes before your class start time to find your way around and get situated. We start all classes at their scheduled time, so please try your best to be on time. Except in the most extenuating of circumstances, we cannot offer refunds for any of our services. In cases where students have given us sufficient notice (48 hours+ for drop-in classes, private lessons, and Open Studios, 4 weeks+ prior to the first class for series enrollments), we can offer an account credit for the amount paid that can be applied to future classes. We do make exceptions for serious injuries or illnesses for which the student can provide us a note from a medical professional. For questions about our refund policies, or to cancel a class, e-mail us at info@stlaerial.org. To guarantee a spot in series classes, drop-in classes, private lessons, parties, or workshops, students must pay in advance. We have gift cards available. Please purchase them here or email info@stlaerial.org if you have questions. You can make up a series class by taking one of our Circus Circuit™ or Aerial Pilates classes, or doing a free open practice. Email info@stlaerial.org for a coupon code to use when signing up for your makeup class or open. You may only make up one class per session. If there’s more than one section of your series class, you can ask the instructor about dropping into the other section. You can use our website! We accept most major credit cards. If you’d prefer to write a check or pay in cash, please email us at info@stlaerial.org. For most aerial apparatuses, proper attire means close-fitting workout clothes that cover the legs and underarms. Do not wear jewelry, unsecured eyeglasses, grommets, or any other objects that can snag or damage the equipment, yourself, your fellow students, and/or your instructor. If there are no students signed up for a drop-in class twelve hours prior to the class start time, the class may be cancelled. If you want to ensure that we keep a class on the schedule, please sign up in advance. Please make sure that you arrive at SLAC on time for your class. You will be required to warm up for 15 minutes no matter what time you arrive, so if you’re five minutes late to class, you’ll miss five minutes of instruction because you will still be warming up when class begins. If you are more than 15 minutes late to any class, you are welcome to stay and watch, but you will not be allowed to participate. Open practice is intended to be a forum to practice what you learn in class; do not attempt to execute new moves or to teach other students. The safest way to learn any aerial or circus skill is with a qualified instructor. We do not recommend ANY other method of learning aerial or circus skills. Do not attempt to rig any equipment. Please ask a staff member if you need equipment adjusted for any reason. With hard floors and bare feet, glass or ceramic containers are not worth the risk. Please bring water in other kinds of containers. Only water is allowed in the practice area. No other drinks, food or gum allowed. Be respectful and kind to the instructors, employees, your fellow students, the studio, and yourself. No photography or video recording is allowed without the express permission of the person being photographed or filmed. No shoes on the mats or apparatus. Please be considerate with cell phone use. In a space with shared apparatuses and training space, it is important that all students practice good hygiene. We request that everyone avoid heavy fragrances and lotions. Absolutely no training under the influence of drugs or alcohol! If your instructor suspects that you may be compromised in this or some other way (i.e. injury, illness, or severe sleep deprivation) you may be asked to sit out and observe your class. Ask for assistance if you are unsure about a move or trick or need spotting. Never train alone and always use a crash mat! If you are injured during class or open practice, inform your teacher or host immediately. Everyone must sign a waiver before attending class, training, or engaging in any activity at SLAC. 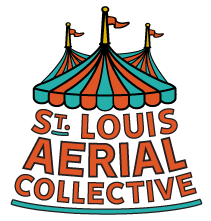 St. Louis Aerial Collective (SLAC) is dedicated to providing a harassment-free experience for everyone, regardless of gender, gender identity and expression, sexual orientation, disability, physical appearance, body size, age, race, or religion. We do not tolerate harassment of participants in any form. This code of conduct applies to all SLAC spaces, including our studio, offices, performances, Facebook pages and parties, both online and off. Anyone who violates this code of conduct may be sanctioned or expelled from these spaces at the discretion of the staff. Some SLAC spaces may have additional rules in place, which will be made clearly available to participants. Participants are responsible for knowing and abiding by these rules. St. Louis Aerial Collective (SLAC) is dedicated to providing a harassment-free experience for everyone. We do not tolerate harassment of participants in any form. If you are being harassed by a member of SLAC, notice that someone else is being harassed, or have any other concerns, please contact the staff at info@stlaerial.org. If the person who is harassing you is on the team, they will recuse themselves from handling your incident. We will respond as promptly as we can. This code of conduct applies to SLAC spaces, but if you are being harassed by a member of SLAC outside our spaces, we still want to know about it. We will take all good-faith reports of harassment by SLAC members, especially staff, seriously. This includes harassment outside our spaces and harassment that took place at any point in time. The abuse team reserves the right to exclude people from SLAC based on their past behavior, including behavior outside SLAC spaces and behavior towards people who are not in SLAC. In order to protect people from abuse and burnout, we reserve the right to reject any report we believe to have been made in bad faith. Reports intended to silence legitimate criticism may be deleted without response. We will respect confidentiality requests for the purpose of protecting victims of abuse. At our discretion, we may publicly name a person about whom we’ve received harassment complaints, or privately warn third parties about them, if we believe that doing so will increase the safety of SLAC members or the general public. We will not name harassment victims without their affirmative consent. If a participant engages in harassing behavior, staff may take any action they deem appropriate, up to and including expulsion from all SLAC spaces and identification of the participant as a harasser to other SLAC members or the general public.